Castle Towers is a shopping centre in the gorgeous hills area of North West Sydney. It is a lovely centre comprising of over 300 specialty shops and they invited me to create bespoke fragrance for their VIP guests for two weeks as a part of their Age of Style celebrations last year. 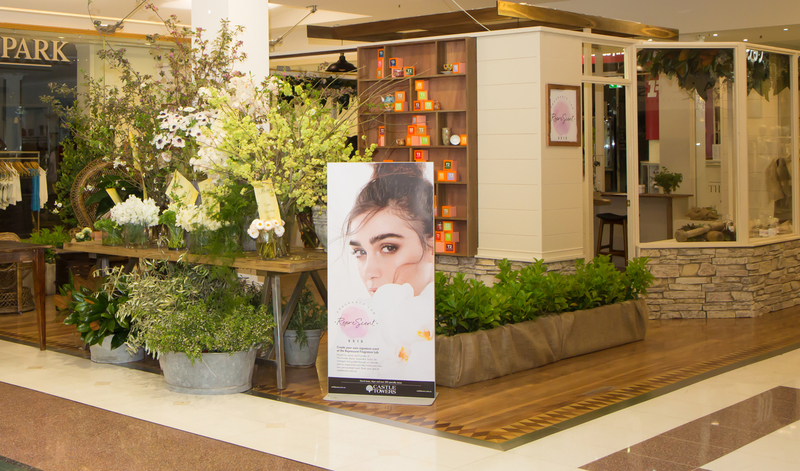 Their idea was to take their shoppers on a sensory journey and help them discover their fragrance style. Collen and Luke Cuneo of Cuneo Productions built me a fragrance lab in the middle of the centre near customer service. My favourite part of the lab was the stunning flowers by Melinda from Lucien Shine Designs. She created a a veritable wall of flowers representing the different fragrance families. 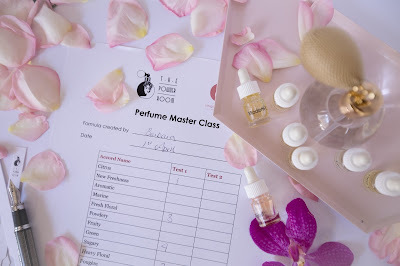 Customers began their session with a cup of tea from Tea 2, they were then ushered over to my little lab, and we discussed all things perfume while I created a bespoke perfume for them based on what fragrance would suit their skin. I met so many women who told me they only wear Chanel No 5. While it is the best selling fragrance of all time, and I love the story and admire Coco Chanel, the fact that it is the best selling fragrance also means that it is the most worn perfume of all time. I like to encourage my clients to explore their individuality and step outside of their comfort zone. At first they can be little resistant to change, but once they smell my creation or recommendation, they often come around! I also recommend other fragrances for them to try when they are in the centre, customers are spoilt for choice at Castle Towers as they have great stores to visit for perfume, such as Mecca (my favourite), L'Occitane, The Body Shop as well as Myer and David Jones. I look at things like the customers skin colour, hair colour and the way they dress as well as their personality to recommend a fragrance style that will sit well on their skin. This is a method that I have refined over 20 years of selling, marketing and creating fragrances. Lyn Harris, perfumer of Perfumer H and ex perfumer of Miller Harris, taught me a lot about this as well. She was the first to show me how different skin types react to different raw materials. We had a press event where I met some lovely bloggers such as Sharon the Makeup Artist, Yan Yan Chan and Madeleine from The Daily Mark. I guided them through the process of creating their own scent using the Cinquieme Sens Olfactorium. The Olfactorium is a mini perfumers organ with little vials of the 19 fragrance families, I show you how to create a formula, and then you start creating! 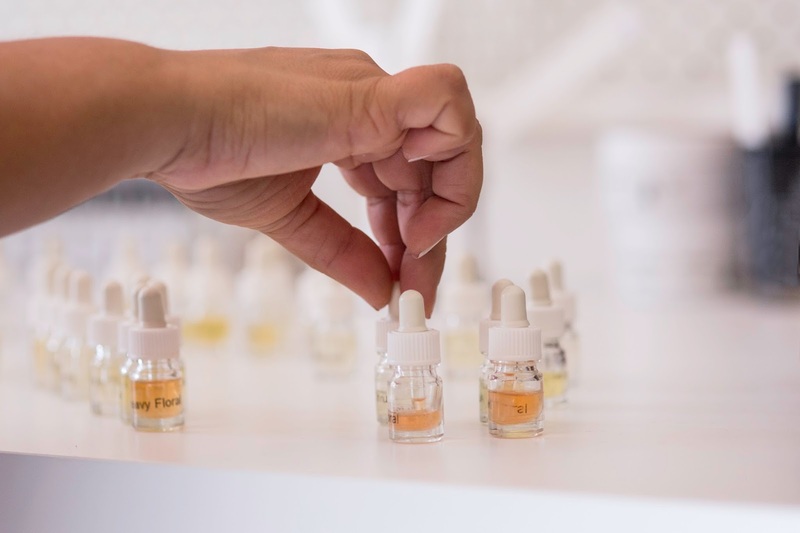 The juice comes from the leading perfume house in France and is possible to create a very good fragrance using these raw materials and my guidance and evaluation. We also had some great press for the event as I was interviewed by a few different publications and even appeared on the cover of the local newspaper! Links below.